We enjoyed a weekend at home (aren't those nice!) with not a whole lot on the books (even nicer, am I right?!). Love the orange and gray - and they should add some Carolina blue to the shop!! Also, Thursday evening my mom and I took Camille to the little Halloween festival going on at Morrison shops. It was so cute! I wanted to share these quick photos from the event. Okay, so Friday night was pretty low-key, and you may know that we do pizza most every Friday night we are in town. We started with a quick trip to the mall to pick up a few things and then let Camille play at the Lego store and the outdoor playarea. Then Ian picked up the pizza while I got the baby fed, bathed (tub disinfecting time once again ... no words), read to, and down to sleep. That night we just kicked back and watched Rosemary's Baby. We are getting a kick out of these old scary movies this time of year! Last weekend we watched Poltergeist. 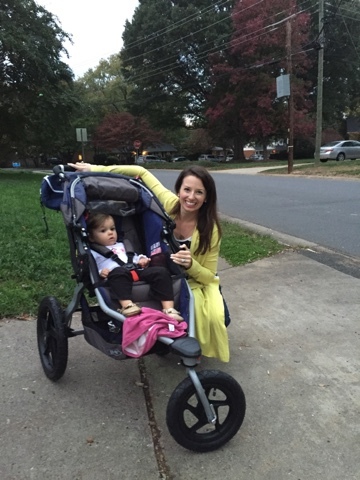 Saturday we took a walk as a family and conquered some tasks around the house. We also had a great lunch out at Maverick Taco on Montford. Lunches out are pretty much the only meals we attempt in public these days, you know? But Camille was 97% well behaved and the tacos were 100% amazing, so ... SUCCESS. 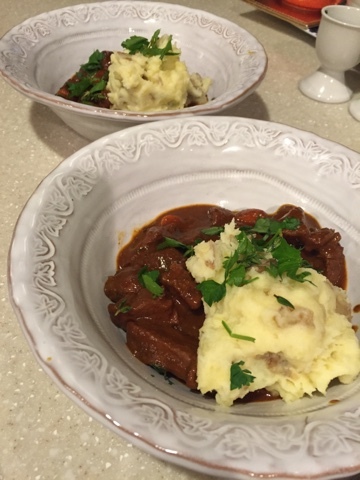 ... and then I cooked beef stew and cheesy mashed potatoes for us for dinner (a Blue Apron meal!) and we watched Dateline outdoors on the patio with dinner since the weather was so nice. Sunday, our friends had a little fall shindig over at their home. We enjoyed catching up with them and attempting to get the little one on the pony. My girlfriend knows this really sweet lady who brought it by to say hello to the kiddos, such a fun idea! Camille would get close and then "no, no, no!" and back into the safety of our arms. Oh well. At least we got some adorable photos of her in the pumpkin cutout! I hope you had a nice October weekend at your home as well! That is such a cute picture of her in the cutout! Good times yesterday! Low-key weekends are always the best. Camille looks absolutely darling in each photo! Fall agrees with her! The beef stew you made looks like it was absolutely DELICIOUS!!! And that picture of Ian hugging Camille??? How gorgeous would that be in black and white and framed?? Love it! She's so adorable!!! What a perfect fall weekend!!! How do you have your outdoor tv set up? We are doing one next year, but it won't be under a roof or anything, so we have to get some kind of weather case. Do you have that or is yours in a patio area? Have a great week!! Camille is seriously adorable! I love her facial expressions! Dinner on the patio is the best! We've been making the most of the weather and do the same thing! I love this time of year! Glad you guys had another great weekend. I can't believe how big Ms. Camille is getting! Looks like yall had a great weekend, other then the bathtime incident haha. Hope you all have a wonderful week! Oh those pics in the pumpkin are SOOO cute! ha! Love the photos of her clinging to you two! Weekends with no plans are so my jam and sadly I don't have enough on my calendar this month! Oh wow!!! What a great way to start the week!! Thank you!! Your weekend sounds amazing! Love those sweet photos of Camille at the party! I need to try the Taco place! We are always up for good Mexican spots! Is it better than Cantina? Awww, love the pics of Camille and the pony! ;) And the one of her face in the pumpkins turned out so cute! !